ATTLEBORO, Mass. – There’s really no other way to put it — North Attleboro’s defense is very good. Just ask Stoughton, Bishop Feehan King Philip, Franklin and now, Attleboro. The Rocketeers walked into Tozier-Cassidy Field at Attleboro High undefeated and walked out with a 14-0 shutout win over the rival Bombardiers. Through five games this season, the Rocketeers have yet to allow more than one touchdown in any given game and only Feehan was able to put up two scores. The defense has allowed a measly 5.6 points per game now. Unsurprisingly, it was the Rocketeers defense that got things started on both sides of the ball. After the teams traded punts, Attleboro took over in North Attleboro territory. Facing a 1st and 16 from the 43 yard line, junior quarterback Tyler McGovern dropped back and fired a pass but North Attleboro senior Patrick Johnson read the play the entire way. Johnson stepped in front of the pass and intercepted it in stride and raced 65 yards untouched for a touchdown. Connor Flynn’s extra point was good giving North Attleboro a 7-0 lead with 6:32 left in the first quarter. It was the fourth pick six for the Rocketeers through five games this year and Johnson was the third different player to do so. North Attleboro’s defense didn’t rest there and came right back out with a big stand. Attleboro gained three yards on first down on the ensuing drive but couldn’t move the ball on the next two and were forced to punt for the second time of the game. The Rocketeers offense then went to work with its most efficient drive of the game. On first down, junior Bobby Mylod (seven carries, 54 yards) raced up the left side for 24 yards and a first down. Sophomore quarterback Chad Peterson (8/12, 66 yards) kept it on the next play for four more and on second down, Nick Rajotte (three carries, 38 yards) came across to the right side and scampered for a 30 yard touchdown. Flynn’s extra point was good, giving the Rocketeers a 14-0 lead with 4:17 left in the first quarter. Although it looked like the floodgates might open for the Rocketeers, neither North Attleboro or Attleboro was able to tack anymore points onto the scoreboard. Attleboro senior Kyle Murphy put a stop to North’s next drive, dropping Mylod for a four yard loss on third and short but the Bombardiers went four and out. The Rocketeers moved the ball but couldn’t covert a 3rd and six and gave the ball back to Attleboro. McGovern hit sophomore Cam Furtado for 15 yards on first down to get the drive going but a rush for no gain and then a false start put Attleboro in a hole. On 3rd and 15, North Attleboro’s Brodey Barr broke up a pass to set up a punt. Instead of a long punt, North Attleboro’s Davon Andrade broke through and blocked the punt. 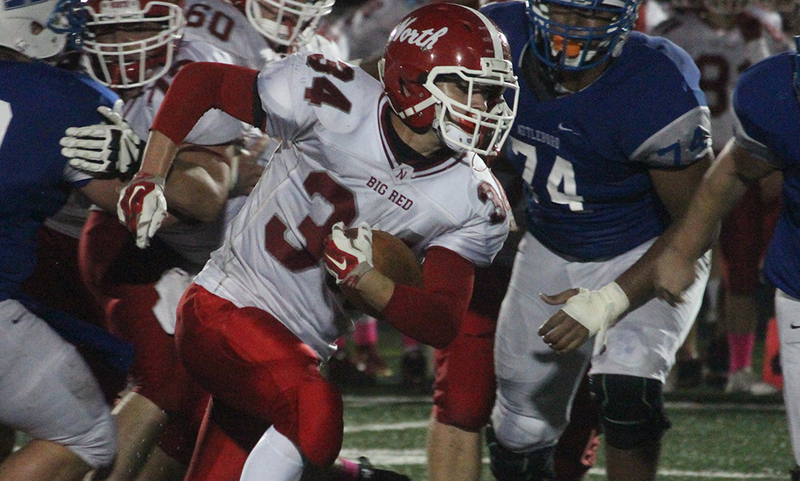 Junior Tom Reynolds was able to haul in the ball in the air and North took over at the Attleboro 32 yard line. North converted a 4th and 2 when Peterson connected with Barr over the middle for 20 yards, setting up 1st and goal from the 5 yard line but there was only five seconds left in the half. The Rocketeers elected to run a play but a low pass fell incomplete and the final seconds of the first half ticked off. Attleboro came up with a big stop to open the second half as North Attleboro attempted to go for it on 4th and 1 but Matt Mahoney jumped in and stopped the play in the backfield. The Bombardiers came out and went with Furtado as the quarterback of the second half and moved the ball the most efficiently all night. Furtado used quarterback runs on the first three downs to get a first down and then floated one that senior Alex Silva went up and grabbed for a 25 yard gain inside the red zone. But the momentum would stop there. Furtado rushed for three yards but Reynolds and Nicholas Thorpe stopped Furtado for no gain on second down. An incomplete pass set up 4th and 7 from the 16 and Furtado tossed one to the end zone but it was over the head of Brendan Nunes and the Bombardiers turned it over on downs. The Rocketeers were able to kill a lot of clock on the next drive, moving the ball 65 yards on 13 plays. Peterson’s (four rushes, 25 yards) eight yard gain was followed by backup quarterback Kyle McCarthy (six rushes, 21 yards) coming in for a rush of nine yards. Peterson hit Ridge Olsen on back to back plays for 11 yards each time and, after a six yard rush from Nick Morrison (16 carries, 86 yards), Peterson hit Olsen for six more yards and a first down. Rushes from Rajotte and McCarthy combined for 17 yards but after an incompletion and a short gain, North faced 3rd and 7. Thats when Owen McKenna came crashing in, sacking Peterson for a 5 yard loss. Flynn attempted a 36 yard field goal but it came up short. Attleboro had to punt once again after going four and out but the defense held and got the ball back four plays later. On 3rd and 10, Attleboro moved forward via a hands to the face call. Nick Morrison came in for a sack on the next play but two plays later, McGovern hit Silva down the right side for 36 yards to the 10 yard line. But once again, it was North Attleboro’s defense that came up big. Two incompletions were followed by a sack from Andrade, and on fourth and goal from the 27 yard line, the pass fell incomplete. North Attleboro was able to run the clock out the rest of the way. 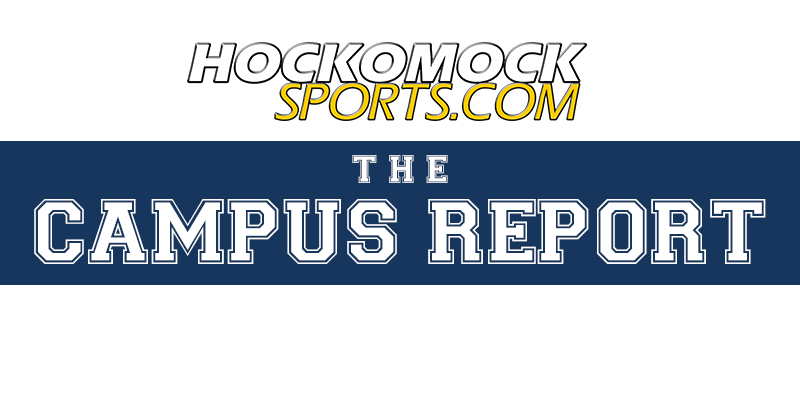 Attleboro’s quarterbacks combined for just five completions on 21 attempts, which is a combination of a strong secondary and the players up front for North Attleboro. North Attleboro finished with nearly triple the yards in the game (282-100) and just under triple the first downs (15-6). 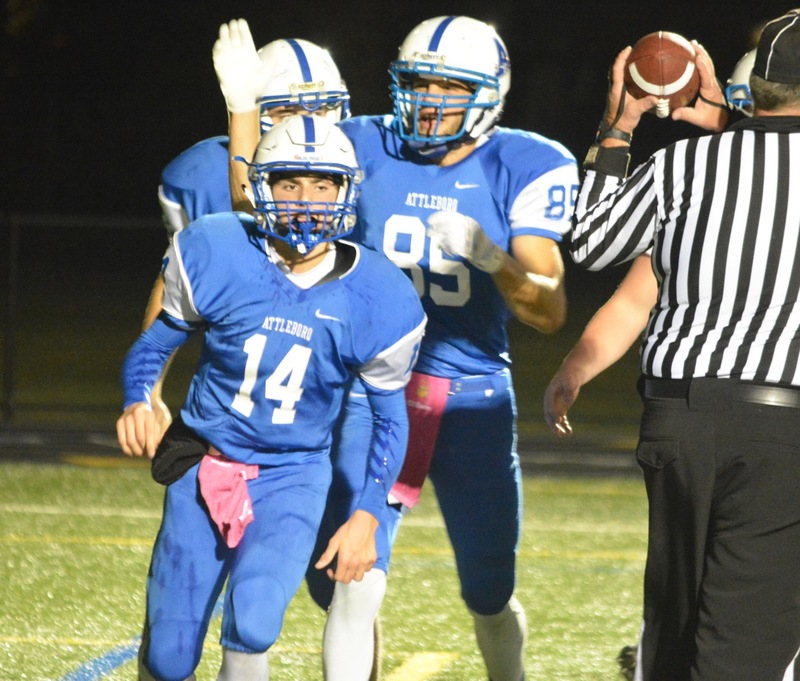 “We just couldn’t get into a rhythm,” Attleboro head coach Mike Strachan said. “We fought though, this was a tough game up front, it was really a battle up front all day long. We just couldn’t get anything going. Offensively we have to look at the film and see what we can improve on. Next week becomes a huge game for us, really the playoffs start for us next week. North Attleboro is now 5-0 overall and have the lead in the Kelley-Rex division at 3-0. The Rocketeers will look to continue its strong start next week when they host Taunton. Attleboro (2-3, 1-2) will look to bounce back when they take a trip to King Philip (2-1, 2-3) next Friday night.